Even More New Rogue Images + In-Depth Analysis! Well, it’s certainly been a good week for the LEGO Star Wars fans, hasn’t it? What with the ‘new’ Death Star Reveal and press release, followed swiftly by all the Rogue One sets being unveiled, it certainly has been a good week. One that is only getting better with these new images courtesy of Hoth Bricks over on their Flickr Page. Some of these images are simply higher-resolution versions of previous pictures whilst some are brand new, but they’re all worth talking about, so I’ll accompany them with a full-on set analysis. Here we go! The HoverTank offered me a very pleasant surprise yesterday when I discovered it is actually only £30 rather than £35, which would of been odd next to a $30 price point…either way, these images don’t really offer too much brand new that wasn’t revealed previously, but they do give a higher resolution look at all the features: a wheel system similar to the First Order Snowspeeder, a pair of spring missiles, a fully enclosed and rather spacious interior, an opening orange crate and many clips for accessories. Some full HD close-ups of the new figures were also unveiled; those Tank Pilots look incredible in my opinion, and Donnie Yen’s (hopefully stand-out) character of Chirrut looks awesome too. Some have said his skin tone is too light, but I can see the reasoning here. 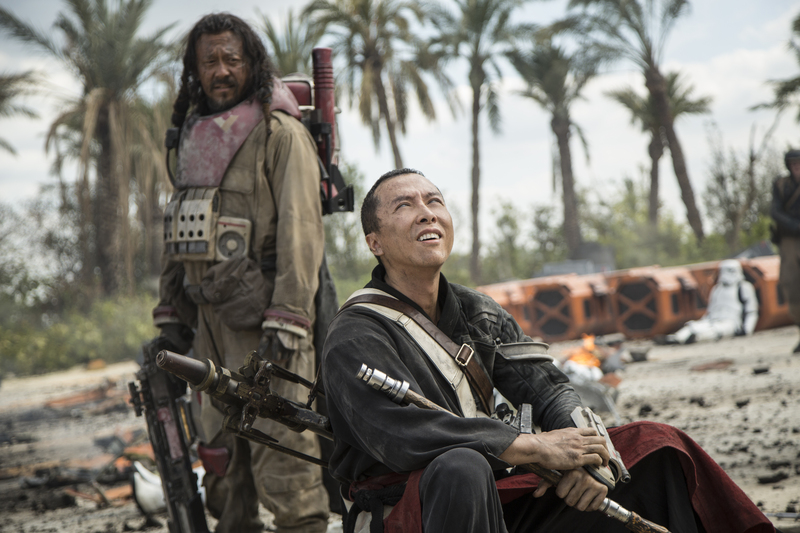 Chirrut and Baze are very close friends in the film, and whilst both actors do have a slightly dark skin tone, Donnie Yen definitely has the lighter skin tone of the two, so they gave his figure a slightly lighter skin colour so as to mimic the contrast of the pair of actors. That’s my theory anyway. As I’ve said previously, the AT-ST set from this wave is easily the most accurate LEGO Model released of this vehicle thus far (which is saying something, since there’s been 4 at minifigure scale). These new images don’t reveal much about this walker other than it’s interior. However, that Interior looks awesome! It’s more roomy than any past iterations, and has storage for accessories and some cool control panels. There’s also some close-ups the figures. Again a great selection; I especially like the build for Baze’s “huge gun”, and the excellent new Rebel Trooper helmet mould that could be used for many custom military figures. These new images are perhaps the least striking (pun intended) of Hoth Brick’s new photos. Some alternate angles of the build are displayed as well as some of a higher resolution. A close-up of the figures are however included; the Shoretrooper and Rebel trooper are my person favourite, and I’m sure that Death Star Trooper will be used for a fair few customs, as if you put Jyn’s head on this figure you get her undercover outfit from the film. You even get the hand-held batons that can can be visible on her back. I was lucky enough to be just 2 rows from the stage at the Rogue One Panel at Star Wars Celebration in July, and the character of Bistan was easily the one to get the best reaction fro the crowd; that’s why I’m so pleased we now have a HD look at his minifigure! And the rest of the set looks cool too I guess. Even though I’m unlikely to buy this set personally because of money and space constraints, I will concede that this set is easily the best in terms of structure and aesthetic. The way that the body is able to support the wings of that length is a marvel in LEGO engineering, not to mention that the entire centre structure has been used for a interior instead of it just being unusable wasted space. The figure selection is also arguably the best in the wave; I adore those Death Troopers, and kudos to the design team for actually printing those imperial insignias on the arm axles of K-2SO, as they look brilliant. I really wasn’t liking this design back a few months ago when it leaked but in hindsight, now that I know this set is incredibly accurate to the source material, it has grown to be a huge highlight for me. Respect to the designer of this one! So, there we have it. I’m sure that this is pretty much it for Rogue One images now until the actual sets get leaked in the last week of September and reviews start popping up (which they inevitably will; it happened last year with TFA). All in all, I think this wave of sets is one of the finest we’ve had in many years, and certainly has redeemed the otherwise disappointing year of 2016 for LEGO Star Wars fans (at least that seems to be the consensus, I thought this year was pretty good personally). Not only are these sets a marvel to behold, but so are the prices (especially in the UK) with some of the best Price to Part Ratios in a long time. I’ll for sure be picking up the AT-ST and Hovertank on the day of release, likely followed by either the U–Wing or Shuttle when I eventually have enough room/money for them. Which of these sets are you most excited about? Tell us below, and be sure to check back soon for the latest LEGO news, here on The Brick Show! Previous Previous post: Toys R Us Bricktober Store Calendar Found In The Wild – Confirms TRU’s Exclusive Minifigure Collection Pack. Next Next post: LEGO Releases Latest Videos Dedicated To Its Rogue One Sets.